Definition at line 31 of file BPFSubtarget.h. Definition at line 59 of file BPFSubtarget.cpp. Definition at line 77 of file BPFSubtarget.h. Definition at line 73 of file BPFSubtarget.h. 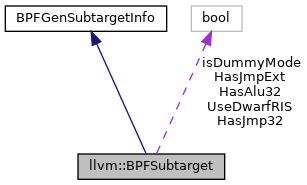 Referenced by llvm::BPFTargetLowering::BPFTargetLowering(), and llvm::BPFTargetMachine::createPassConfig(). Definition at line 72 of file BPFSubtarget.h. Definition at line 71 of file BPFSubtarget.h. Definition at line 76 of file BPFSubtarget.h. Definition at line 86 of file BPFSubtarget.h. Definition at line 83 of file BPFSubtarget.h. Definition at line 80 of file BPFSubtarget.h. Definition at line 74 of file BPFSubtarget.h. Definition at line 28 of file BPFSubtarget.cpp. References llvm::sys::detail::getHostCPUNameForBPF(), HasAlu32, HasJmp32, HasJmpExt, ParseSubtargetFeatures(), and UseDwarfRIS. Definition at line 55 of file BPFSubtarget.h. Referenced by getHasAlu32(), and initializeSubtargetDependencies(). Definition at line 52 of file BPFSubtarget.h. Referenced by getHasJmp32(), and initializeSubtargetDependencies(). Definition at line 48 of file BPFSubtarget.h. Referenced by getHasJmpExt(), and initializeSubtargetDependencies(). Definition at line 45 of file BPFSubtarget.h. Definition at line 58 of file BPFSubtarget.h. Referenced by getUseDwarfRIS(), and initializeSubtargetDependencies().